This 1831 church was extended by Arthur W. Blomfield in 1882. 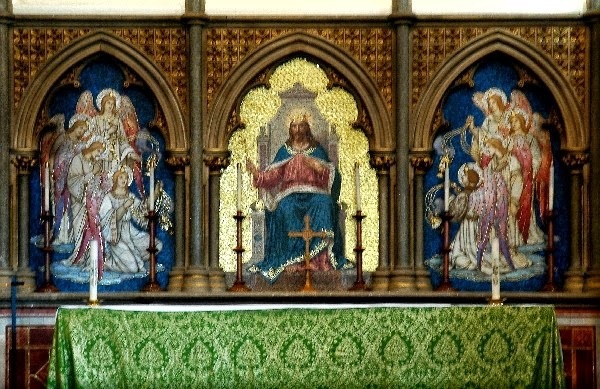 The central panel of the triparte reredos depicts Christ in Majesty in mosaic by Salviati from 1894. The opus sectile mosaics on either side featuring groups of angels were made by the mosaic company of James Powell and Sons between 1910 and 1914. The sketches were made by Coakes and the cartoons by Hardgrave. Newman, John. West Kent and the Weald. New Haven: Yale University Press, 1980. 469. Hadley, Dennis. Powell's Opus Sectile Locations. 28.
Who did the mosaic cartoon - Burne Jones? In cases where I know who made the cartoons, I try to add that to the posting. Unfortunately, I haven't been able to find that information regarding this mosaic. 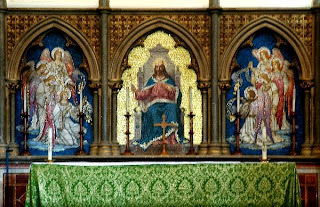 It's possible the design for the central panel was by Blomfield himself. I do know that Powell's made the two opus sectile panels that are on either side. I think those have a more Burne-Jones look to them.